The BA Arts Center has announced that the 16th International Summer Festival is set to be held from Monday, 16 July 2018 until Saturday, 18 August 2018. 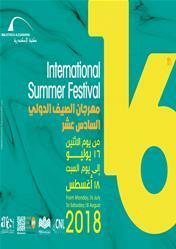 The International Summer Festival is a major cultural season and a tradition that the BA has established in order to add a colorful and unique taste to summer in Alexandria. The BA Arts Center is keen on presenting a cultural output that balances between all new and different forms of art, as well as presenting the classics of Egyptian art, which continues to attract a diverse audience. This year’s festival has a diverse program featuring popular artists, such as Ali El Haggar, Carmen Soliman, Nesma Abd Elaziz, and bands such as Cairokee, Massar Egbari, HOH, and Zap Tharwat. The events will also include theatrical performances from several artistic troupes, in addition to poetry recitals by Amr Hassan and Hesham el-Gakh.